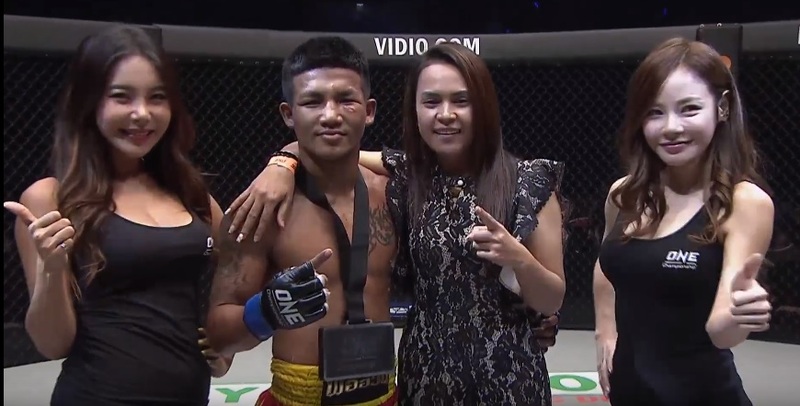 Rodtang “The Iron Man” Jitmuangnon, 21, of Thailand has earned his first victory in ONE Championship’s striking-only league ONE Super Series. On September 22, 2018, the Thai martial artist made his promotional debut at “ONE: Conquest of Heroes” at the Jakarta Convention Center in Jakarta, Indonesia. “ONE: Conquest of Heroes” featured 10 mixed martial arts bouts and 2 striking-only matches under ONE Super Series. In the 10th bout of the evening, Jitmuangnon competed in a Muay Thai contest against Sergio “Samurai” Wielzen, 30, of Suriname in the flyweight division. After three three-minute rounds, the Muay Thai flyweight bout between Jitmuangnon and Wielzen was left in the hands of the judges. In the end, referee Atsushi Onari raised the hand of the Thai contender as the winner via unanimous decision. Winning at “ONE: Conquest of Heroes” improved Jitmuangnon’s record to 253 wins, 40 losses and 10 draws. On the other hand, Wielzen’s record downgraded to 46 wins, 20 losses and 2 draws. Jitmuangnon is training out of Jitmuangnon gym in Northern Bangkok. He is a two-time Omnoi Stadium Muay Thai Champion. On the other hand, Wielzen is a two-time W5 Kickboxing World Champion. While Jitmuangnon made his ONE Super Series debut at “ONE: Conquest of Heroes,” it was the second time the Surinamese martial artist competed in the striking-only league of ONE Championship. Wielzen made his ONE Super Series debut at “ONE: Unstoppable Dreams” on May 18, 2018 at the Singapore Indoor Stadium in Kallang, Singapore. He competed for the inaugural ONE Super Series Muay Thai Flyweight World Championship but lost to Sam-A Gaiyanghadao, 34, of Thailand. The other ONE Super Series bout at “ONE: Conquest of Heroes” was a Muay Thai contest between “The Funky Drummer” Fabrice Fairtex Delannon, 36, of French Guiana and Yodpanomrung “The Lightning Knee” Jitmuangnon, 24, of Thailand. The latter lost to the former via split decision.